From 1962 the US Air Force launched a series very small technology satellites called ERS (Environmental Research Satellites). The satelltes were built by TRW Systems Group for the United States Air Force Office of Aerospace Research (AFOAR). Depending on the shape, these satellites are also referred to as the Tetrahedral Research Satellite (TRS) or Octahedral Research Satellite (ORS). The basic configuration of the TRS Mk.2 spacecrafts was a regular octahedron measuring 23 cm on a side. 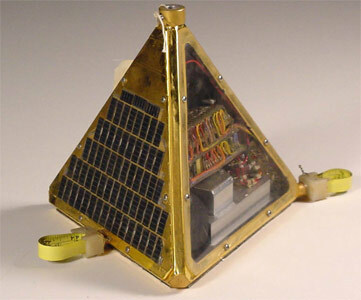 Solar cells mounted on each side of the faces provide sufficient electrical power to operate the experiments and the telemetry system when the satellite is illuminated by the sun. No internal battery or command system were provided. The satellite subsystems consisted of electrical power, antenna, telemetry, experiments, and mechanical structure. ERS 12: measured the intensity of charged particles in the magnetosphere. The payload consisted of an omni-directional radiation detector to measure electron levels greater than 0.5 and 5 MeV and proton levels between 10 and 20 MeV and 50 to 100 MeV. ERS 13: carried omni-directional radiation detectors to measure electron and proton levels in order to determine the intensity of charged particles in the magnetosphere.